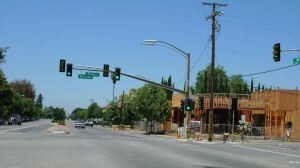 The new traffic signals at the intersection that have been erected for the last few weeks have been turned on today, and the old traffic lights removed. 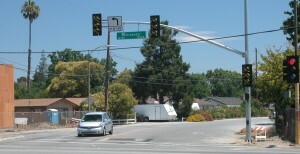 Amy Olay, Senior Civil Engineer with the City of San Jose Department of Transportation, tells the South Winchester News that the new traffic signals will offer a dedicated left turn signal from Williams Road onto Winchester Boulevard. The scope includes upgrade of all traffic signal equipment to current standards. The new street signage includes street address numbers. Olay also described changes to the southeast corner. Sidewalk, curb, and gutters will be constructed including necessary drainage improvements. All non signal equipment related work such as the civil improvements are scheduled for completion by end of October 2009. This entry was posted on Thursday, August 27th, 2009 at 6:08 pm by John Vink	and is filed under Uncategorized. You can follow any responses to this entry through the RSS 2.0 feed. You can leave a response, or trackback from your own site.